Since the arrival of Europeans to Rapa Nui (Easter Island) in 1722, it has been a mystery how the monumental moai were carved from the inland quarry and moved to the coast. How could the natives of Rapa Nui move the multi-ton monoliths such a distance. 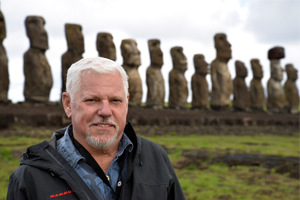 Hear from Dr. Terry Hunt and view the documentary film that reveals how the moai walked to where they are today.